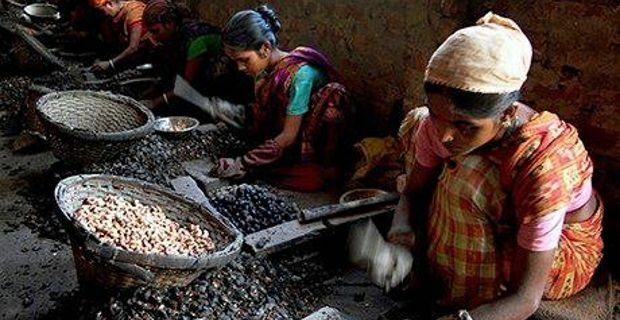 As a result of unfair trading practices, cashew nut workers in India face appalling conditions for 30p a day. The highly nutritious nut is very popular in Europe and the States, where it sells very well. But in order to keep prices down, big international buyers, like supermarket chains, have transferred most of the costs and risks of trading down to the humble workers and farmers in developing countries. India is the single largest cashew nut producer in the world. Almost 60% of cashews consumed globally come from there. The business is indeed vital to the country, especially the regions in the south, where most of the processing takes place. Last year the total value of cashew exports was up to £500m, while the number of local families involved in the trade is well over 1 million. The cashew industry in India, therefore, is critical to the well being of people as much as the local economy. But big overseas companies seem to shy away from this fact and act mostly unfairly toward exploited workers that could benefit from the profits. In 2007, a report from the anti-poverty agency Action Aid highlighted pressures from UK retailers to drive prices down. These resulted in cuts on workers conditions, wages and health & safety. More 'unofficial' processing units started to appear all over, with higher hazard for those working there. Safety and fair conditions are always a critical factor, and even more in the cashew nut trade. During de-shelling process, in fact, the nuts produce a caustic liquid that effectively burns the skin. Conditions in the industry are so appalling that workers are not given gloves to work with, and with wages sometimes as low as 30p a day, they cannot afford to buy them. But something is changing. Attention has been brought to the problem, and NGOs are currently lobbying for strong legislation at EU level. As a result, the European commissioner for internal markets and services, Michel Barnier, is due to make an announcement on unfair trading practices for discussion by the parliament next month.